After selling their hardware business to Microsoft back in April, Nokia agreed not to make any own-brand smartphones for three years. Instead they have had more time to focus on other products like their first version of their tablet series, the N1. The tablet was first teased yesterday on Twitter but was announced officially on Tuesday morning at the Slush startup conference in Finland. With striking similarities in looks with the iPad mini, the N1 features a 7.9 inch display with an aspect ratio of 4:3 and 2040 x 1536 pixel resolution. The tablet also has the same 6.9mm depth as the iPhone weighing 318 grams. Under the hood, the N1 is sporting a 2.3GHz Intel 64-bit Z3580 Atom processor and comes with 2GB of RAM and 32GB of onboard storage. Unfortunately it does not come equipped with microSD support but does come with the Type-C reversible USB 2.0 new power adapter that is optimized to match that of Apple's lightning connector. The device also comes with an eight megapixel rear-facing camera with auto focus and a five megapixel front-facing fixed-focus camera. 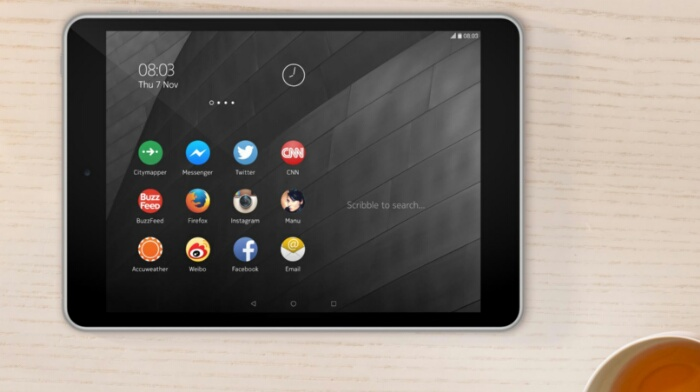 What sets this tablet apart from some of the major brands like Apple and Samsung is that it comes preloaded with Nokia's own Android Z Home Launcher. The app has been in the making since June earlier this year and we are finally getting a look at it. Z launcher isn't your typical home launcher in which you organize apps and widgets in the order you want allowing for fast access to the features you want. Instead it gathers data from looking at the patterns in which you access apps, which people you call, and what webpages you browse to bring them up during that time period as suggestions. If what you want to access is not suggested then you can simply use your finger to scribble the first letter and the launcher will bring up frequently used apps that start with that letter. Though the app will come preloaded on the N1, it is available on the Google Play Store where it can be used on your current devices that are on any pre-Lollipop OS. It is listed as "beta" in the store so if you choose to download it you can expect to find a few bugs. The N1 is set to be released in the first quarter of the year in China for $249. There is no announcement on when it will be making it's way to the rest of the world.